Hey you are either a banjo geek or a wannabe banjo geek, or you wouldn’t be reading this, right? Well coming from a lifelong banjo addict, I want to remove the top of Pandora’s banjo for a moment. A single magical element that causes wonderful tone in a banjo does not exist. What makes for a wonderful tone in reality is the musicianship and skill of the player along with an acoustic tone chamber that generates a pleasant musical resonance. The secret to an inspiring musical tonality is a combination of all the following factors. A proper fingerboard with the right geometry and playing action. The ring of dense material upon which the head is stretched is called the tone ring. Traditionally in most Bluegrass banjos, this component is made from bronze. 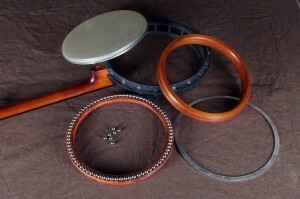 The ideal formula for the tone ring is debated in banjo circles, but any formula containing copper, tin lead and zinc will work. The magic depends on the proper execution of the 4 requirements above and mounting the tone ring solidly upon its base. The character of the sound differs slightly from instrument to instrument. But with years of experience in building and setting up instruments, one gets better at control- ling the sound quality. 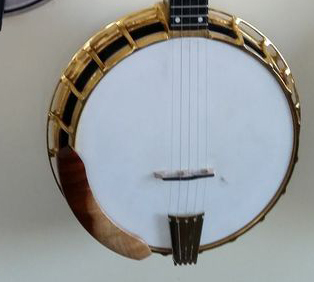 The general myth that lives on in banjo circles is the one of the “Pre-war” banjo. The tone rings from these old banjos is most often cited as the magic component, while in reality the old seasoned wood of the rim is responsible for most of the pleasant resonance that comes from them. All these facts aside, The tone ring is still a link in the chain of good tone. So if you are building an in- strument or just want to know more about them, here is a short tone ring crash course. Bronze tone rings are cast in foundries and are machined to final shape on a lathe. As a major tone ring manufacturer, Nechville obtains cast billets and machines them to close tolerance in their CNC lathe. Generally speaking, alloys with a 5% or higher lead content create rings with a good bass response. Lower lead alloys tend to encourage a wider range of harmonic con- tent which may cause a brighter perceived tone. The pursuit of the ideal reproduction of the best sounding tone rings has resulted in clever marketing campaigns that add confusion to the well-known business of tone ring manufacture and have fostered false hopes in prospective buyers. The tone ring is a part of a system that needs to work together in order to fulfill your musical desires. You can trust that Nechville is one company that will reveal the clearest path to achieving the sound that you are after. Please take a look at our 30 year track record of producing world class custom instruments. No other company will give you the benefit of choice between classic design and helical mount banjos. No other banjo company is as vertically integrated and dedicated to providing tailored customer service. Whether you need tone ring advice, or want to upgrade your whole instrument, we are here to help.